Berkeley city officials are drafting a measure that will require cell phone retailers to put labels on packaging warning consumers that wireless devices could emit cancer-causing levels of radiation. Officials said the ordinance’s language will be drafted in a way that complies with the First Amendment, after a similar effort in San Francisco was defeated in federal court on the grounds that it violated phone manufacturers’ constitutional rights. Harvard Law School professor Lawrence Lessig calls us the 30 percent concerned about the dangers of cellphones, especially to infants and children through their teens. He makes the case that laws will be written to warn consumers about dangers from cell phone radiation and Berkeley might be the first to succeed. Lessig proclaims that no one reads the fine print buried in a cellphone user’s manual: “Avoid direct contact with body; hold the cell phone 5/8 of an inch away from the head.” No one questions the damaging effects of radio-frequency radiation on human cells, despite many scientific studies supporting that position and despite a rising body count: increasing incidence of brain cancer on the side of the head where the cellphone is habitually held. Three states (California, Maine, Hawaii) are now in a race to set the legal precedent to make it law that RF safety warnings are taken out of ‘fine print’ and put in clear view so consumers can make informed decisions. Berkeley’s neighboring city of San Francisco recently gave up on a legal battle to label cell phones with warning labels stating that cell phone radiation is “possibly carcinogenic”. Now Berkeley is ready to pick up where SF left off. Except this time city officials and lawmakers will be better prepared to battle the well funded lawyers representing the wireless industry. Berkeley’s city officials say they have learned from San Francisco’s similar attempt, which ended two years later in federal court with the SF Board of Supervisors ultimately withdrawing the ordinance. To avoid the fate met by San Francisco, Berkeley is planning to consult with a Harvard University law professor to draft the sticker language so it meets legal First Amendment guidelines. The CTIA, which is the wireless industry’s trade association successfully fought off San Francisco’s attempt to force warnings in part by arguing that forcing manufacturers to issue cell phone radiation warnings violated their First Amendment rights. As long as the proposed ordinance passes a debate scheduled for September 9th, Berkeley, CA could be the first U.S. city to require such cell phone health warnings that inform consumers of potential risk from RF radiation exposure. Berkeley can expect a major legal assault from the telecommunications industry, noting the wireless industry was swift to respond to Berkeley’s proposal by sending a four-page letter to the City Council on July 3 stating that the proposal violates federal regulations and the matter has already been settled by the courts. “Any attempt to place labels on cell phones or their packaging contradicts the clear message of federal regulatory agencies that have carefully considered this issue, which is that devices compliant with the federal standards are safe for consumer use,” wrote Gerald Keegan, senior director of legislative affairs for CTIA – The Wireless Association, an industry group. 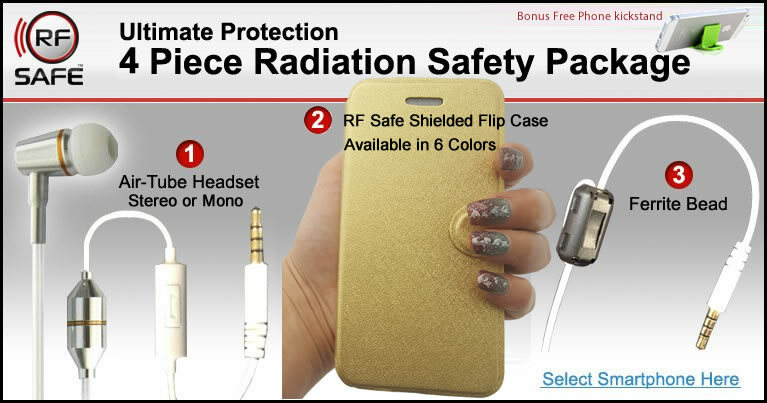 Scientists Don’t Agree with The Wireless Industry’s Assumptions of Cell Phone Radiation Safety. Head of UC Berkeley’s Center for Family and Community Health, Joel Moskowitz has been studying the cell phone radiation safety issue since 2009, and has concluded that cell phones are “one of the top emerging public health risks.” The evidence is very compelling. “It’s just a matter of time,” he said. Moskowitz points out that studies cited by the cell phone industry are outdated. Newer and more complex wireless technology, coupled with people spending increasing amounts of time on their phones, is almost certain to lead to an uptick in brain cancer from RF exposure, he said. Radiation from cell phones penetrates the skin and skull and absorbs into the brain tissue, having an adverse affect on cells. Phone radiation can also affect sperm count among men who carry phones in their pockets, he said. “With cell phones, distance is your friend,” he said.